(L to R) Amira Jackson, Amari Black, Devonte Smith and deputy Miguel Ruiz. Ruiz hand-delivered presents to the children Tuesday (Dec. 24). The gifts came from the Lancaster Sheriff Station’s annual Holiday Food and Toy Drive. LANCASTER – Amira Jackson, Amari Black and Devonte Smith were all smiles Tuesday afternoon, when a Lancaster sheriff’s deputy showed up with gifts just in time for Christmas. The youngsters were three of six children in the Sienna Heights apartment who received toys from the Lancaster Sheriff’s Station, according to Community Relations deputy Miguel Ruiz. “We’re trying to help out families who are in desperate need during this time of year,” Ruiz said. This holiday season, the Lancaster Sheriff’s Station collected more than 600 toys and 441 food items as part of its annual Holiday Food and Toy Drive, Ruiz said. The donations came from sheriff’s deputies and personnel at the station, as well as city staff and residents, Ruiz added. Ruiz checks his stack of presents before heading to Lake Los Angeles to hand deliver gifts to another family. Ruiz hand-delivered presents on Monday to children in the pediatric ward at Antelope Valley Hospital and to children at the Valley Oasis Domestic Violence Shelter. On Tuesday, Ruiz personally delivered gifts to two households in Lancaster and Lake Los Angeles. “I feel pretty fortunate just to see the smiles on the kids’ faces and bring them some happiness for the holiday season,” Ruiz said. 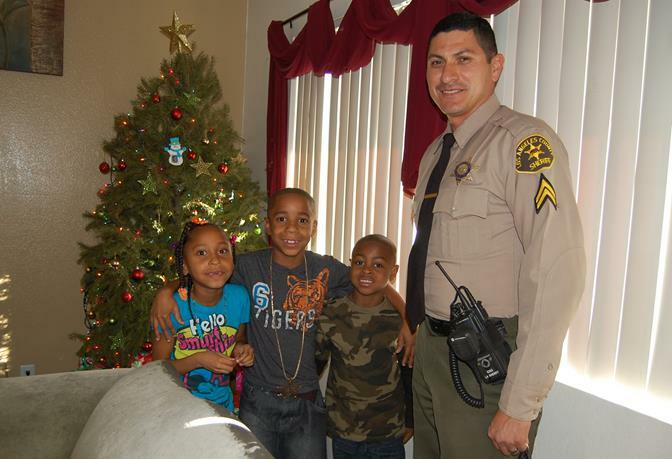 Lancaster sheriff’s deputies will continue to spread cheer through Christmas Day, Ruiz said. “We just want to wish everybody a happy and safe holiday season,” Ruiz added.